April 8, 2018 In working with my clients, my approach as a nutritionist is generally toward recommending people consume more fresh foods in their whole form while at the same time reducing their intake of processed and refined foods. I let people pick the worst offenders on their own and find something better to replace it with. I try to avoid giving long-winded lectures on food quality because people can get lost in minutiae. What good is it, for example, to cut your beloved fried chicken out of your diet (at least partially a whole food), when you are still consuming large quantities of soda (not a whole food by any stretch)? Even worse, people will give up eating egg yolks for fear of cholesterol (they are a wonderful whole food!! ), but continue eating candy bars with abandon (not even close to a whole food). These types of behaviors are the result of patchy information given by the media most people pay attention to, which cause them to lose sight of the forest for the trees. So I get a little perturbed when people ask me “What do you think of such-and-such a product?” My responses are: is it highly processed? Does it have a lot of sugar? Tsk! You should be able to answer this! After a little bit of time working with me, people know better than to ask me these types of questions. Even so, just yesterday a long-time client asked me: “I’m not a coffee drinker, so what do you think about this XYZ energy drink to get me started in the morning?” I cringed, of course. The drink in question is a chemical cocktail with a lot of isolated and processed vitamin-y sounding ingredients. I thought, “just drink the coffee! It comes from a ground up bean, for heaven’s sakes.” But I couldn’t really tell her to do that, so I recommended she try out maté instead. At least maté comes from a tree and not a laboratory or factory. And yet, in the world of nutrition, the in-depth discussion of the negative effects of processed foods and the (almost unknowable) effects that their completely un-natural hodge-podge of ingredients will have when combined in your body, becomes inevitable. Some of you may be surprised (although you should not really be that surprised, as I am human too) that I consume processed foods. Just today I found myself drinking a refreshing can of peach-tea flavored Monster Rehab. The reasons I bought it: I was at Wal-Mart, it was late, Keith and I were very tired and I saw that there were only 3g of sugar per serving along with plenty of caffeine. With my recent opening of a new office, working full-time in the old office, and studying for my Master’s in Nutrition, this beverage seemed to be more of a necessity than a luxury. Plus, I have consumed this drink before and I like the taste. So now I am challenged to answer some questions for myself: is Monster Rehab healthy? What are all these ingredients (and I count 25) for? What will happen to me when I drink this, either positive or negative? I WILL NOT, and I repeat, WILL NOT engage in this type of exercise at length again. I hope you get the point. Processed foods are unhealthy, period. So after this, further yakking about it will not be helpful, just redundant. Or will it? Filtered Water Provides liquid. Dilutes contents to make drinkable. Generally accepted as a necessity for life 17 . Can be toxic in large amounts. Black Tea Solids Provides a "tea-like" aroma Black tea has potential health benefits 15 but there is no mention if the tea "solids" might have the same benefits as the tea itself. Glucose Sweetener 1 , part of the "Monster Rehab Energy Blend" A naturally occurring source of energy 14 . There are only 2 grams of glucose per serving. Peach Juice Concentrate Flavoring, Possibly a coloring 1 In general, fruits are high in beneficial phytochemicals 16 . It is unclear how much of the nutrients will remain when the peach is consumed in this form. Taurine Part of the "Monster Rehab Energy Blend", nutrient, also a flavoring agent 9 Taurine in a non-essential amino acid with a wide arra of actions in the body 9 . Phosphoric Acid Flavoring, acidulant (give a sharp taste to foods) 6 Can be toxic irritant or corrosive at high concentrations (not found as a food additive) 6 . Magnesium Lactate Source of dietary Magnesium 10 Magnesium is a necessary mineral nutrient which performs many important functions within the body 17 . Calcium Lactate Pentahydrate Source of Calcium. Also a flavoring agent 11 Lactic acid is a naturally occurring substance in the human body so it is of no safety concern 11 . Caffeine Part of the "Monster Rehab Energy Blend" Reports vary as to the effects of caffeine. Some states it is not a safety concern at normal levels of consumption 12 . May cause spontaneous abortion in certain pregnant populations when consumed in large amounts 12 . Caffeine has also ben shown to decrease insulin sensitivity 13 . Mono-potassium Phosphate Acidity regulatory, sequestrate (improves the quality and stability of a food; a preservative) 7 May cause calcium loss when consumed in excess 8 . Luckily, there is plenty of calcium added to this drink, so, not to worry. Potassium Sorbate Preservative 1 Recognized as safe by the FDA 1 . Causes genotoxic effects in lymphocytes in vitro 22 . Acesulfame Potassium Sweetener 1 Recognized safe by the FDA 1 . Has been found to alter the gut microbiome and cause obesity and reduced insulin sensitivity in mice 24 . Sucralose Sweetener 1 Recognized as safe by the FDA 1 . Contributes to liver inflammation in mice 25 . Concentrated Coconut Water Flavoring? Source of electrolytes? Coconut is a type of fruit and contains fiber and nutrients in its whole form 16 . Salt Used widely to flavor foods 26 . Recognized as safe by the FDA 26 Sodium in an essential nutrient and is a critical electrolyte in regulating body fluids 17 . D-calcium Pantohenate (Vit B5) Nutrient 18 B-Vitamin important in macro-nutrient metabolism 18 . Gum Arabic Thickener, emulsifier, or stabilizer 2 As a dietary fiber. Gum Arabic may help reduce adiposity in type II diabetics 27 . Ester Gum Keeps oil in suspension in water, emulsifier 3 FDA agrees more studies are needed to fully ascertain its safety; however extremely large amounts are needed to show toxicity in lab animals 3 . Inositol Part of the "Monster Rehab Energy Blend" A naturally occurring sugar in cell-membranes; important in cell signaling potential chemopreventive effects 20 . Acai Fruit Extract To add a "superfruit pucnch" Has antioxidants; has been shown to reduce oxidative stress in men 29> . Goji Berry Extract To add a “superfruit punch” Used in Traditional Chinese Medicine, the goji berry contains lots of interesting chemical compounds and has potential health benefits 28 . Cyanocobalamin (Vit B12) Nutrient 18 Performs several complex, important functions within the body 18. So, after going through all that, what conclusions can we draw? 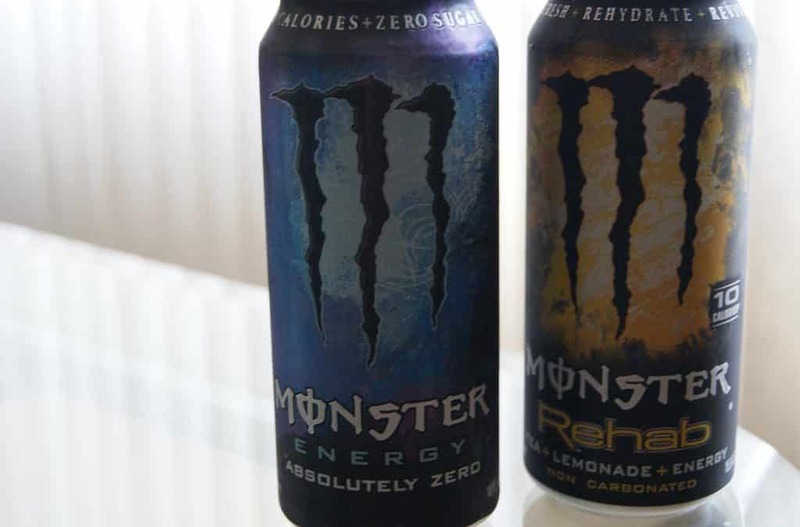 Should anyone be drinking Monster Rehab? Some sources cite the dangers of energy drinks in general30 and even really, really, bad dangers of diet energy drinks specifically31. Not to say anything at all about the potential problems with synthetic nutrients32! Therefore I am forced to say that the answer is, “it depends.” It depends on how much you are drinking, your stage of life, if you have any medical conditions, what other foods you are consuming regularly, whether you are male or female, whether you are pregnant or breastfeeding, the circumstances of your life, etc. Whether you can or should consume these drinks also depends on a multitude of factors of which neither you nor I are aware, since not all the science has been done. Can you see why I hate these types of questions? It makes me feel like a failure as a nutritionist if I can’t give you a “thumbs up/down” for a particular processed food item within five seconds. But how should I know? I could spend 12 hours researching that one item and all its little ingredients and still not get to the meat of whether it’s safe or good. Tell you what, why don’t YOU do the research, and tell ME whether you think it’s okay for you. Or better yet, just focus on a variety of whole, unprocessed, unrefined, natural, fresh foods in your diet. Humankind has survived for at least millennia on whole foods. Keep the processed foods to a minimum. You will be assured of their safety if you are barely consuming them. And it will save us both a lot of stress and aggravation! References 1. Overview of Food Ingredients, Additives & Colors. Food and Drug Administration Web site. Published November 2004. Revised April 2010. https://www.fda.gov/Food/IngredientsPackagingLabeling/FoodAdditivesIngredients/ucm094211.htm Accessed April 8, 2018 2. Sec. 172.780 Acacia (gum arabic). CFR – Code of Federal Regulations Title 21. U. S. Food & Drug Administration Web Site. Revised April 10, 2017. https://www.accessdata.fda.gov/scripts/cdrh/cfdocs/cfcfr/cfrsearch.cfm?fr=172.780 Accessed April 8, 2018 3. Glycerol Ester of Wood Rosin. IPCS INCHEM Web Site. http://www.inchem.org/documents/jecfa/jecmono/v35je05.htm Accessed April 8, 2018. 4. Trisodium Citrate. IPCS INCHEM Web Site. Published March 9, 2003. http://www.inchem.org/documents/jecfa/jeceval/jec_2346.htm Accessed April 8, 2018. 5.Citric Acid and its Calcium, Potassium and Sodium Salts. IPCS INCHEM Web site. http://www.inchem.org/documents/jecfa/jecmono/v05je24.htm Accessed April 8, 2018. 6. UKPID Monograph: Phosphoric Acid. IPCS INCHEM Web Site. http://www.inchem.org/documents/ukpids/ukpids/ukpid73.htm Accessed April 8, 2018. 7. Potassium Phosphate, Monobasic. PubChem: Open Chemistry Database Web site. Published March 27, 2005. Updated April 7, 2018. https://pubchem.ncbi.nlm.nih.gov/compound/Potassium_dihydrogen_phosphate#section=Storage-Conditions Accessed April 8, 2018. 8. Phosphoric Acid and Phosphate Salts. IPCS INCHEM Web Site. http://www.inchem.org/documents/jecfa/jecmono/v17je22.htm Accessed April 8, 2018. 9. Taurine. PubChem: Open Chemistry Database Web site. Published September 16, 2004. Updated April 7, 2018. https://pubchem.ncbi.nlm.nih.gov/compound/1123#section=Top Accessed April 8, 2018. 10 Magnesium Lactate. PubChem Open Chemistry Database Web site. Published May 4, 2006. Updated April 7, 2018. https://pubchem.ncbi.nlm.nih.gov/compound/6536825#section=Top Accessed April 8, 2018. 11. Safety Evaluation of Certain Food Additives and Contaminants: Aliphatic Acyclic Diols, Triols and Related Substances. IPCS INCHEM Web site. http://www.inchem.org/documents/jecfa/jecmono/v48je16.htm#2.0 Accessed April 8, 2018. 12. Cafeine. IPCS INCHEM Web Site. Published March, 2002. http://www.inchem.org/documents/sids/sids/CAFEINE.pdf Accessed April 8, 2018. 13. Keijzers GB, Galan BED, Tack CJ, Smits P. Caffeine Can Decrease Insulin Sensitivity in Humans. Diabetes Care. 2002;25(2):364-369. doi:10.2337/diacare.25.2.364. 14. alpha-D-Glucopyranose. PubChem Open Chemistry Database Web Site. Published September 16, 2004. Updated April 7, 2018. https://pubchem.ncbi.nlm.nih.gov/compound/79025#section=Top Accessed April 8, 2018. 15. Yang CS, Landau JM. Effects of Tea Consumption on Nutrition and Health. The Journal of Nutrition. 2000;130(10):2409-2412. doi:10.1093/jn/130.10.2409. 16. Brown A. Fruits. In: Understanding Food Principle and Preparation. 5th ed. Stamford, CT: Cengage Learning; 2015: 300-326. 17. Insel P. Ross D. McMahon K. Bernstein M. Water and Major Minerals. In: Nutrition. 6th ed. Burlington, MA: Jones & Bartlett Learning; 2017: 464-501. 18. Insel P. Ross D. McMahon K. Bernstein M. Water-Soluble Vitamins. In: Nutrition. 6th ed. Burlington, MA: Jones & Bartlett Learning; 2017: 427-463. 19. NCI Drug Dictionary: L-Carnitine L-Tartrate. National Cancer Insitute Web site. https://www.cancer.gov/publications/dictionaries/cancer-drug/def/l-carnitine-l-tartrate Accessed April 8, 2018. 20. NCI Drug Dictionary: Inositol. National Cancer Institute Web site. https://www.cancer.gov/publications/dictionaries/cancer-drug/def/inositol Accessed April 8, 2018. 21. Smith RL, Cohen SM, Doull J, Feron VJ, Goodman JI, Marnett LJ, Munro IC, Portoghese PS, Waddell WJ, Wagner BM, Adams TB. Criteria for the safety evaluation of flavoring substances. Food and Chemical Toxicology. 2005;43(8):1141-1177. doi:10.1016/j.fct.2004.11.012. 22. Mamur S, Yüzbaşıoğlu D, Ünal F, Yılmaz S. Does potassium sorbate induce genotoxic or mutagenic effects in lymphocytes? Toxicology in Vitro. 2010;24(3):790-794. doi:10.1016/j.tiv.2009.12.021. 23. Beezhold BL, Johnston CS, Nochta KA. Sodium Benzoate–Rich Beverage Consumption is Associated With Increased Reporting of ADHD Symptoms in College Students. Journal of Attention Disorders. 2012;18(3):236-241. doi:10.1177/1087054712443156. 24. Bian X, Chi L, Gao B, Tu P, Ru H, Lu K. The artificial sweetener acesulfame potassium affects the gut microbiome and body weight gain in CD-1 mice. Plos One. 2017;12(6). doi:10.1371/journal.pone.0178426. 25. Aitbaev KA, Murkamilov IT, Fomin VV. Liver diseases: The pathogenetic role of the gut microbiome and the potential of treatment for its modulation. Terapevticheskii arkhiv. 2017;89(8):120. doi:10.17116/terarkh2017898120-128. 26. Sodium Chloride. PubChem: Open Chemistry Database. Published March 25, 2005. Updated April 7, 2018. https://pubchem.ncbi.nlm.nih.gov/compound/5234#section=Top Accessed April 8, 2018. 27. Babiker R, Elmusharaf K, Keogh MB, Saeed AM. Effect of Gum Arabic (Acacia Senegal) supplementation on visceral adiposity index (VAI) and blood pressure in patients with type 2 diabetes mellitus as indicators of cardiovascular disease (CVD): a randomized and placebo-controlled clinical trial. Lipids in Health and Disease. 2018;17(1). doi:10.1186/s12944-018-0711-y. 28. Bucheli P, Gao Q, Redgwell R, et al. Biomolecular and Clinical Aspects of Chinese Wolfberry. In: Benzie IFF, Wachtel-Galor S, editors. Herbal Medicine: Biomolecular and Clinical Aspects. 2nd edition. Boca Raton (FL): CRC Press/Taylor & Francis; 2011. Chapter 14. Available from: https://www.ncbi.nlm.nih.gov/books/NBK92756/ 29. Alqurashi R, Galante L, Rowland I, Spencer J, Commane D; Consumption of a flavonoid-rich açai meal is associated with acute improvements in vascular function and a reduction in total oxidative status in healthy overweight men, The American Journal of Clinical Nutrition, Volume 2016: 104(5); 1227–1235. https://doi.org/10.3945/ajcn.115.128728 30. Breda JOJ, Whiting SH, Encarnacão R, Norberg S, Jones R, Reinap M, Jewell J. Energy Drink Consumption in Europe: A Review of the Risks, Adverse Health Effects, and Policy Options to Respond. Frontiers in Public Health. 2014;2. doi:10.3389/fpubh.2014.00134. 31. Harb JN, Taylor ZA, Khullar V, Sattari M. Rare cause of acute hepatitis: a common energy drink. BMJ Case Reports. January 2016. doi:10.1136/bcr-2016-216612. 32. The Effect of Imbalance in the “Filtrate Fraction” of the Vitamin B Complex in Dogs. Science. March 14, 1941: 261.